John William "Bill" Ricketts' early history is uncertain. 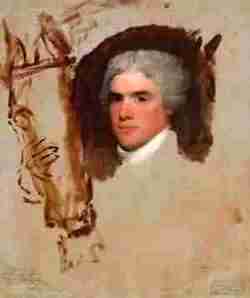 It is believed that he was born in Bilston, Staffordshire England in October of 1769. Other accounts suggest that he was born in Scotland. John Bill Ricketts is considered to be the father of the American circus. 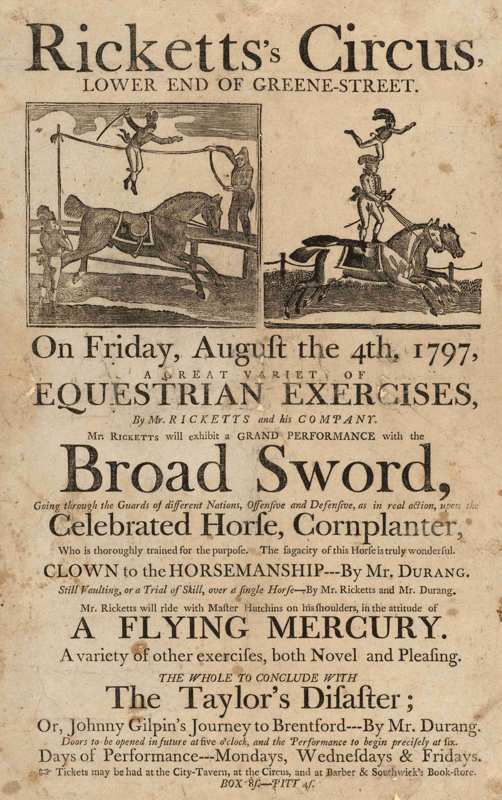 Although there were many traveling entertainers performing in early America, Ricketts was the first in this country to combine equestrians, acrobats, trained animals and clowns in one assembly. This format was already in use in England where Ricketts had performed as an equestrians. John Bill Ricketts began his performing career at age 17, training under the famed equestrian and manager Charles Hughes. 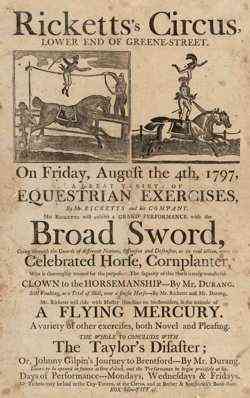 In 1786 he performed as a equestrian and clown at the Jones’ Equestrian Amphitheater in Whitechapel. In 1792 Ricketts sailed from England to America. Soon after his arrival, he began building his circus amphitheater in Philadelphia Pennsylvania, (at that time Philadelphia as serving as the capital of the newly formed United States). The building was located between Independance Hall and Oellers' Hotel. In the fall of 1792 he started training horses, equestrians and acrobats. 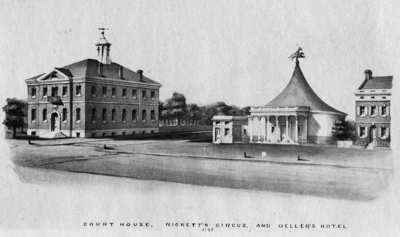 Ricketts' Circus opened on April 3, 1793 and was a huge success. President George Washington attended the performances on April 22, 1793 and January 24, 1797. It was stated that Washington, " put aside cares and worries and went to Ricketts' riding school to seek enjoyment and pleasure". Ricketts' Circus hosted a birthday ball and also a retirement party for Washington. In 1795 Ricketts hired Matthew Sully, a prominent English singer, acrobat and clown who had preciously worked at Sadler's Wells Theatre in London. Later that year John Durang joined the circus. Durang is considered to be the first American born circus clown. Most of the know history of John Bill Ricketts and his circus comes from the writings of John Durang. 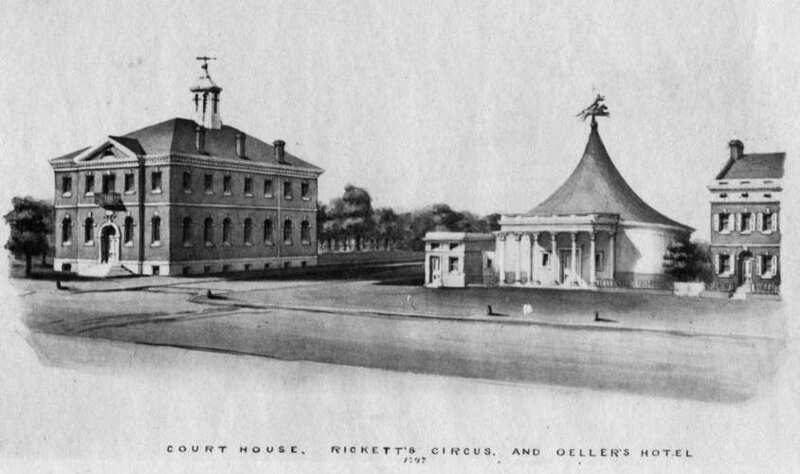 After the success and notoriety of his Philadelphia circus, Ricketts opened circuses in New York, Albany and gave performances at various towns in New England and Canada. Ricketts opened a second unit operated by his bother Francis which showed in Lancaster, York, Baltimore, and Annapolis. On December 17, 1799 tragedy struck. A fire began in the circus building and spred quickly through the circus and then to the adjacent building the prestigious Oellers' Hotel. Both buildings burned to the ground. Durang wrote of the fire, "This winter through the carlessness of a drunken carpenter who was in the employ of the circus, who let a candle stand under the roof of a room above the stable where he keep his bottle, set fire to the back part of the circus while yet the horsemanship was going on." Durang was "dressing for Don Juan when the fire was discovered. We had the good fortune to save all the horses, the scenery and wardrobe and every moveable article, even the doors, windows, and pillows of the front. The circus was entirely burnt to the ground to the great loss of Mr. Ricketts and company, and deprived me of a benefit". As with Ricketts early history, information on the years after the fire are conflicting. It is known that he did not rebuild his amphitheaters and left the country. Most accounts state that Ricketts sailed for England along with many of his performers and horses. The ship along with Ricketts and his entourage were lost at sea. However the writings of Durang and official documents differ. An official account of the voyage stated that Ricketts departed Philadelphia May 1, 1800 aboard the schooner Sally, bound for Barbados. The ship's captain was Jesse Smith and the cargo consisted of "10 horses, 2 carriages, provisions, lumber, dresses, scenery, and apparatus for an amphitheater (circus), and was the property of John Bill Rickets". On June 3, 1800 the ship was seized by the French pirate Capt. Rufa "Brilliante". A deal was made with the pirates by a West Indies businessman, permitting Ricketts along with his performers and equipment be put ashore on the island of Guadeloupe, where the troupe re-grouped and continued to perform.